KATHMANDU, September 11: The Commission for the Investigation of Abuse of Authority (CIAA) has urged the media and the general public not to question the ongoing investigations into corruption cases being carried out by the anti-graft body. The public call from the anti-graft body comes amid growing public outrage over the sluggish investigation into high-profile cases, and the mainstream media exposing a series of corruption scandals in recent days. CIAA, the anti-corruption agency, mandated to investigate into corruption cases and take the accused to the court, is being criticized for not giving due priority to investigate into high-profile cases. Complaints related to the Nepal Oil Corporation's land purchase scam, embossed number plate system for automobiles, Sajha Prakashan scam and irregularities in granting affiliation to medical colleges, have been registered at the anti-graft body. The CIAA, however, has not booked any of the accused although months have passed since the complaints against them were filed. “In recent days, several communications media and social media have raised issues of public concern including the NOC land procurement, embossed number plates, affiliation granted to some medical institutions and corruption at Sajha Prakashan. This is very natural. The commission takes the comments made on the issue positively. However, the commission is seriously concerned over some fictitious and accusatory comments included in various media reports,” said the CIAA in a press statement issued on Saturday. The CIAA said it feels that such comments will not affect its investigations, but send a wrong impression to the public about the commission. NOC Managing Director Gopal Bahadur Khadka has been accused of embezzling millions of rupees in purchasing lands for fuel storage facilities. The parliamentary committee has already asked the CIAA to investigate into the matter and prosecute those accused. The CIAA, however, has been overlooking the case for months. 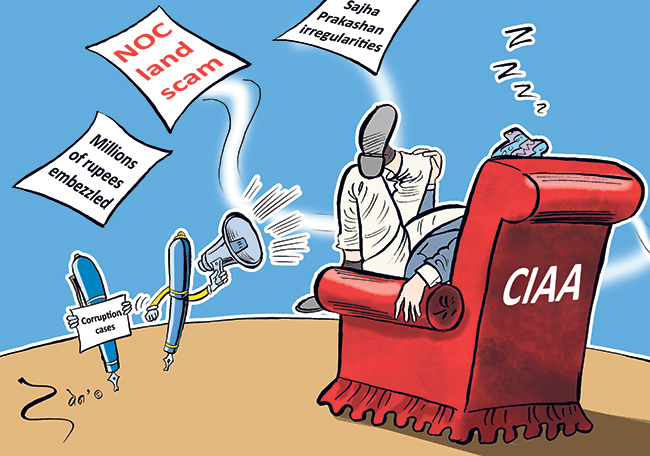 Due to the delay in taking action against those involved in NOC land purchase scam, a section of lawmakers has pointed fingers at CIAA commissioners. The CIAA has been accused of reluctance to take immediate action against the irregularities related to Sajha Prakashan, affiliation issue related to medical colleges, and embossed number plates.